I don't necessarily love to travel, but with many of my family members and friends in New Jersey (I live in South Carolina), traveling has become a pretty regular part of my family's schedule. "Isabel, how do you keep up with this way of healthy eating while you’re on the road?" The very simple answer is PLANNING, PLANNING, PLANNING...but then again, that's the answer to eating healthy even when you're not traveling. If you're going on the once-a-year family vacation or the occasional long-weekend trip to a new destination, it really is OK to ease up on your healthy eating plan. Plus, it's easy to get back on track after the holidays (or a big family vacation) with Beyond Diet's 7 days of accelerated weight loss meal plans. But for those of you who travel quite often, it's important to know exactly how to maintain a healthy eating plan for weight loss while on the road. For me, I feel so much better when I continue to fuel my body with nutritious foods, even when I'm away from home. And no, it doesn't have to be "perfect" (and you don't need to be perfect either!) but my travels are so much more enjoyable when I'm feeling energized and healthy the whole time. Below is the travel packing strategy I have used and refined pretty successfully over the past few years. It works for airports, car travel, staying on track during the holidays, and even just being away from the house for the day (like going to work all day long!). 1. Invest in a travel cooler bag (or 10). I end up using one of my cooler bags at least once a week. You want to find one that is light (it will get pretty heavy when you pack it with food), easy to carry (find one that has a shoulder strap), and contains many compartments (side pockets and front pocket). You also want to invest in some ice packs. For airport travel, I like to use the small soft ice packs as opposed to those hard blue blocks. Remember, you want to keep this as light as possible. 2. Stock up on BPA-free plastic containers. I keep some plastic containers on hand for travel. I always use glass storage containers in my house for all leftovers, but if I’m going to be eating something at an airport or rest stop, I want to be able to eat my meal and then throw away the container. I obviously don’t want to throw away my nice glass containers, so I use plastic. Of course, you want to make sure the containers are BPA-free (and always let your food cool before letting it touch plastic!). 3. 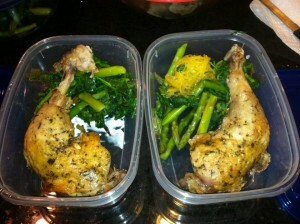 Do a little bit of food prep. 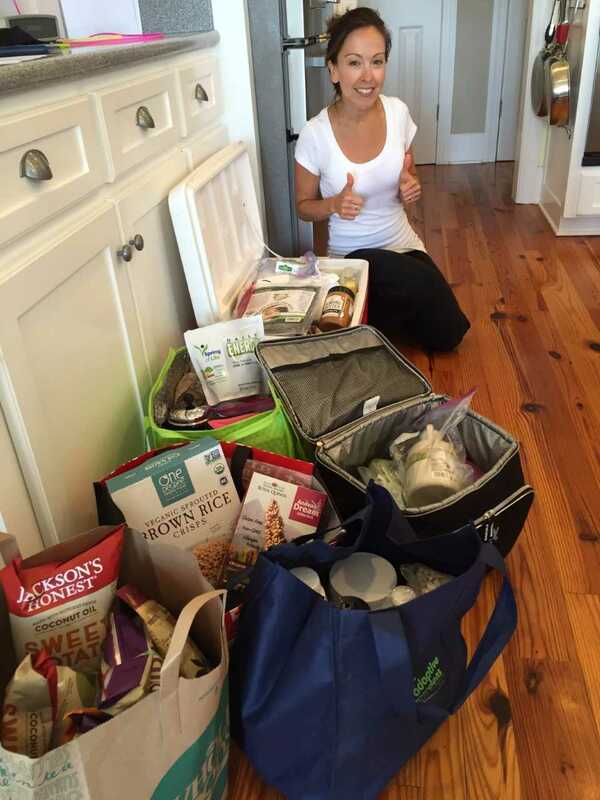 Now here is where the major planning comes into play...you must think a few days ahead about which foods you need to have in the house to prepare and cook for your travel day. Some of my favorites are hard boiled eggs, cut up carrots and cucumbers, healthy baked goods (homemade is best), leftover chicken (which you'll see below), raw nuts and fruits (especially apples and bananas which are super easy to transport). Here's one of my travel meals for a past trip. The 2 leg quarters came from a whole baked chicken I baked the night before (remember, you have to plan ahead). We ate the breast and wings for dinner, but I saved the leg quarters for my trip. The spinach, asparagus, and spaghetti squash are also left over from the night before (I made more than we needed for dinner for this purpose). 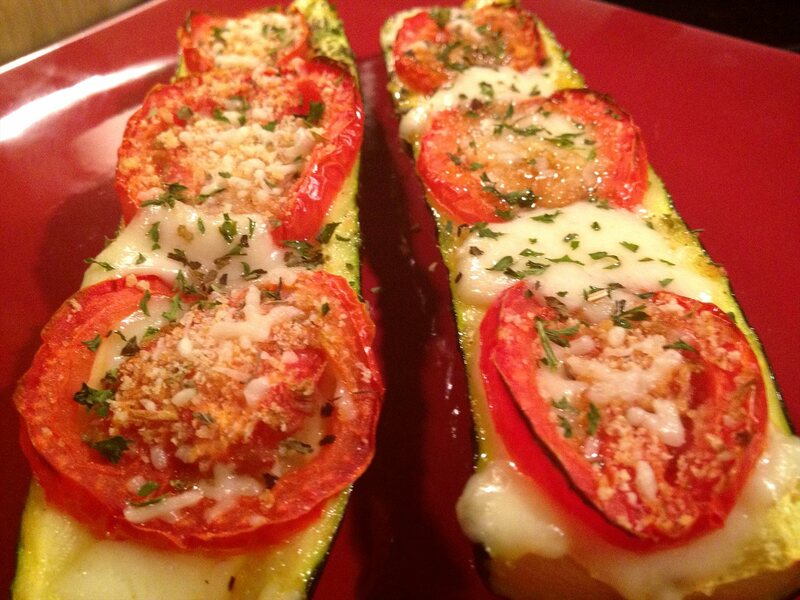 My travel meal was all leftovers...super easy! I absolutely never, ever leave home without my energizing greens drink. This powerful cocktail keeps my immune system strong and my energy levels high when I'm hopping on and off airplanes and traveling from place to place. It also squashes any cravings I have all day long (which comes in handy when you're surrounded by fast food on the road, grandma's famous pumpkin pie at Thanksgiving, and "specialty" coffees all year long). 5. Get creative at restaurants. 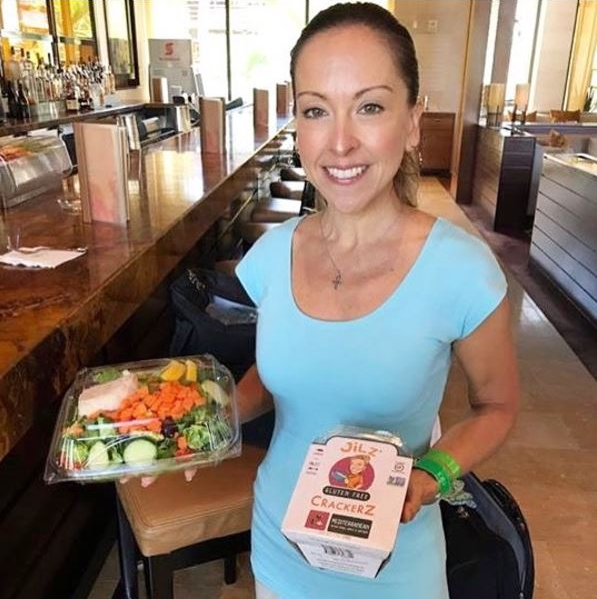 Here I am in the Bahamas holding a delicious salad I had the restaurant prepare for me. I asked them to ple on as many salad vegetables as they had (hold the onions), and I had some canned chicken and gluten-free crackers with me (that I packed in my suitcase). The next time you travel, remember, you don’t have to surrender to poor airport food. Use the tips above to turn all your travel days into healthy days. What are your favorite travel foods? Let us know in the comments below! What kind of gluten-free crackers do you eat? Thanks Isabel. I have a lot of allergies so travelling for me is a torture. I bring some of my food in the airplane sometimes. But others, they do not allow. One of the coaches told me when I was going to Tanzania not to be so strict. If there is nothing I can not eat, please eat. And when you come back you will do the program. I followed her, I ate oranges, potatoes, steaks everyday (since were the only things that I can eat safely due to my allergies), and I lost 3 kilos in two weeks. So since then, I do not stress much, I plan in advance (bring some raisins with me) and prepare a lunch box when I go to meetings (hard boiled eggs and orange). In Africa or in other countries I can not eat fresh vegetables. And it is working out. I lost 30 pounds and I am trying to lose the last 10 pounds. My BMi is in the normal range, not any longer overweight and I am feeling happy. All my clothes of 20 years ago fit! Everybody thinks that I go new clothes! I like my two cups coffee first thing in the morning with 1 tbs of real butter 1 tbs honey 1 tbs of coconut oil blended well in blender. Living with diabetes can often have a series of obstacles, one of them being the daily management and control of your blood sugar. You may feel that your blood sugar is stabilized, but one hour later it's out of control. 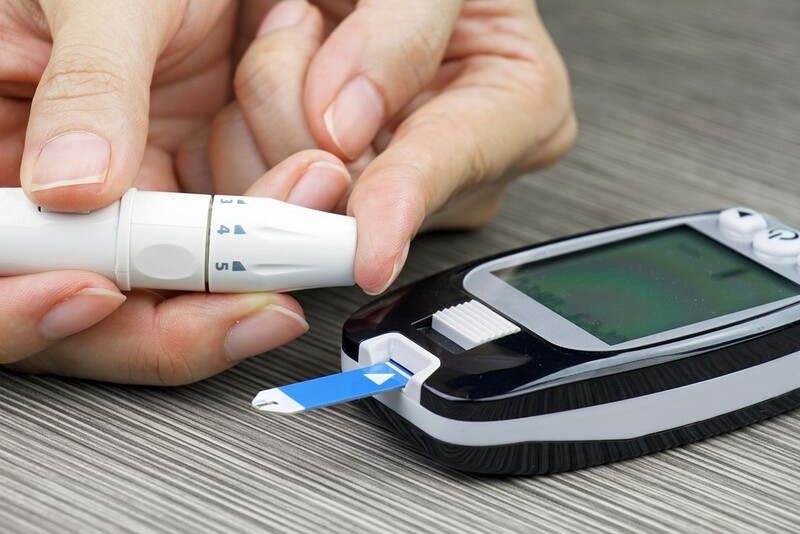 Here are several steps you can take to assure that you manage your blood sugar properly.